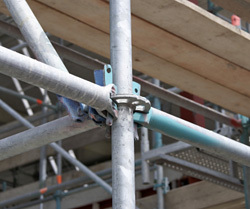 If you are in the market for cheap scaffolding, you might want to take some time to write out a list of questions that you'll be asking suppliers before making a purchase. The fact that this type of equipment can be costly is not the only reason why you need to conduct some thorough research before deciding whether or not to invest in a product; this platform is going to be providing you or your workers with support during a construction job, and if it isn't of the quality that you think it is, you or your employees might end up getting injured or worse. Second Hand Scaffolding - is it Worthwhile? In order to save some money, many companies prefer to purchase second hand materials, since these products will usually get the job done without costing a small fortune, but this also means that individuals need to ensure they are getting a quality product. A few questions that need to be asked when inspecting used scaffolding includes; whether the material is in good condition, or if it shows signs of wear and tear, and whether all of the most important parts of the cheap scaffolding are going to be included in the purchase. These parts include clamps, standards, platforms and ledgers. If any of these parts are missing, it is up to you to replace them, since you are responsible for ensuring that the item is safe and sturdy before you begin putting it to use on a job site where it will be responsible for your safety and the safety of your employees. Who Are you Purchasing the Scaffolding from? When you make the decision to buy cheap scaffolding, you might want to turn to dealers instead of purchasing from private individuals. Since dealers have their names and reputations to think about, they often put more effort into ensuring that they are providing their clients with quality goods that have been inspected before the sale; this is not always the case with individual sellers. Has a Professional Inspected the Condition of the Scaffolding? Before this type of platform can be used on a construction site, a professional will usually have to come out to the site and inspect these items. Once they have gone through every last detail of the scaffolding, they will then make up their minds about whether the equipment is safe to use. If you are going to be purchasing cheap scaffolding, you might want to take this one step further by asking a professional to inspect the item beforehand; you never know how much this could end up saving you in the long run. When it comes to your safety or the safety of your employees, you simply cannot take any chances, and this means asking all of the right questions before you make the decision to purchase this type of equipment. If at any point you are unsure about buying cheap scaffolding, do not hesitate to have your concerns addressed before bringing the item home and making use of it. Rolling scaffolding is a highly versatile mobile working platform popular with tradesman and DIY enthusiasts alike. It's worth taking the time to choose a good scaffolding supplier thus ensuring you get high quality product at the best possible price. Scaffolding Services - What Can They Offer Me? It's always a good idea to find out what services you can expect from scaffolding companies before hiring. If your unsure about putting up scaffolding correctly and safely you may consider using the services of a scaffolding erector. Whether your a builder, tradesman or DIY enthusiast scaffolding towers provide a safe platform to work at height. This space is available for your text link.